We saw an opportunity to combine engineering and communications. It seemed there had to be a way to use marketing and communications with the same engineering technology that we implemented to created life-like product simulations. There was, so we jumped in with both feet. Because we are versed in corporate communication through visualization, we were able to produce MedVisor, a fusion of cutting edge technology and understanding. MedVisor dental is the flagship product of Reality Engineering, a product development firm in Vancouver, Wash., that specializes in three-dimensional animations for industrial, commercial and professional applications. The company was founded in 1998 by Jeff and Larry Jackson with the vision that a synthesis of engineering and communications technologies could be applied not only to create product simulations, but also for marketing and communications enterprises. Reality began developing communications portfolios for clients that were built around three-dimensional product models. Clients discovered they could maximize cost efficiencies and minimize time to market by utilizing these portfolios for a wide range of marketing and communications endeavors, from training to trade shows and from sales tools to speaker support. Reality Engineering's team of animators and programmers are always coming up with great ways to create understanding. 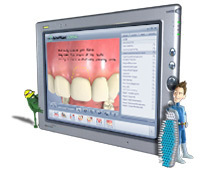 Brusher Bailey educates children and eases apprehension for those children who are nervous about going to the dentist.